Every Nov. 11, we stop and think about a very special group of Americans: veterans. On Veteran’s Day, it is important to reflect on how lucky we are to have had men and women fight for our freedoms. You may know one of these people, you may even be one of these people. Either way, veterans have had an effect on each and every one of our lives and it is important to thank them for that. One of my favorite people in the world happens to be a veteran, and below you’ll find an excerpt from the Goose River Press Anthology dedicated to him. Jack Leddin on his 80th birthday (2011). Often we all fall victim to taking the wonderful gifts we have in life for granted. During the continuity of our daily routines, it is easy to lose focus on what is truly important in life. However, every once in a while, life can hit you and remind you just how lucky you are. For me, I am lucky to have such an amazing family. I am also grateful and take pride in America, this wonderful place we call home where it is an honor to serve your country. One thing that I am constantly thankful for in life are the amazing role models I have been able to look up to, especially Jack Leddin. Jack Leddin is many things. 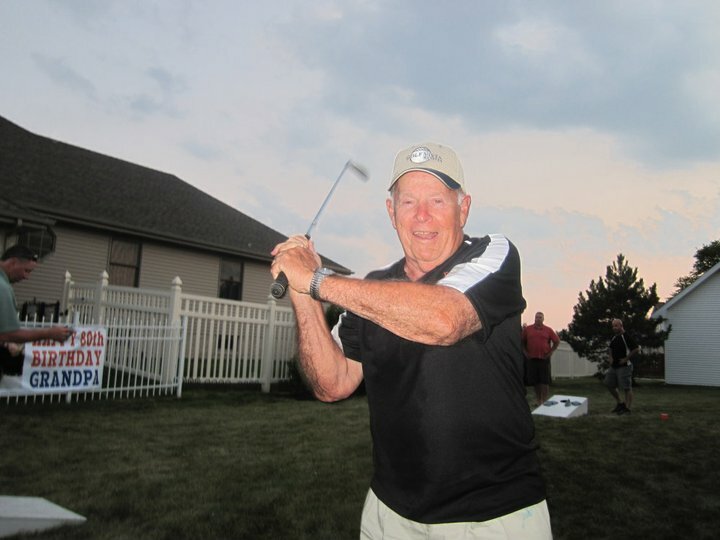 He is a father, a retired employee of the Illinois Bell Phone Company, and a great golfer. He is also my grandfather and he has always been a source of inspiration in my life. One of the most important qualities that Jack holds is that he is a reliable man. You can always count on him to stick to his word and to lend a helping hand. This, among many of his other outstanding qualities, was something that he learned while serving in the United States Navy. In the interim time after he finished school and before he was married, Jack spent four years in the Navy, which he describes as a great time. He joined the Navy by choice after finishing high school as opposed to being drafted by the Army. “Any branch of the service I think that is one of the greatest things a kid could do if they don’t want to go to college because they learn the basic things of discipline, responsibility, and organization. You learn to take care of yourself be responsible for yourself,” says Jack. He also explains that one of the reasons as to why the Navy was so great was because he was able to travel the world, which he may not have been able to do otherwise. During his four years he visited Japan, Korea, and China, and even spent three months living in Hawaii. He worked as an officer on a destroyer. “[Working as an officer was] a good job and [the ship] was very accommodating and very nice,” says Jack. When his four years began coming to a close, Jack had to think about what steps to take next. “I probably would’ve thought about shipping over at the time. The problem is, when you ship over, you don’t really know where you’re going to go,” he explains with a smile. “They can tell you a lot of wonderful things but you never know for sure.” He instead opted to come home and start off a life of his own, meeting, as he kindly puts it, his “sweetheart” and the couple went on to have five kids and ten grandkids. Although Jack decided not to continue life in the Navy, he still looks back fondly at his time in the service and still describes it as one of the best times in his life. His home is filled with mementos from the Navy, ranging from an American flag to a window from the destroyer he had worked on. He made a lot of great friends in the service, as well as some good memories, but most importantly, he learned the skills and qualities of what it takes to make for a great man, which is what he is today. “It had a big impact when you finally got to work and got a job because you have the responsibility to [take on a job] and you’re happy with what you’re doing. Especially if you get a job you like,” he explains. Jack says that the best part of being in the Navy was the privilege of being able to do it. While his time in the Navy made him proud to be an American, his service and dedication to his country, and his family, has made me proud to be his granddaughter.